Lasers in medicine and dentistry are considered cutting-edge technology, but they’ve actually been around for quite a while. The first mention of a possible application in dentistry was almost 50 years ago when Leon Goldman, MD experimented with a ruby laser. 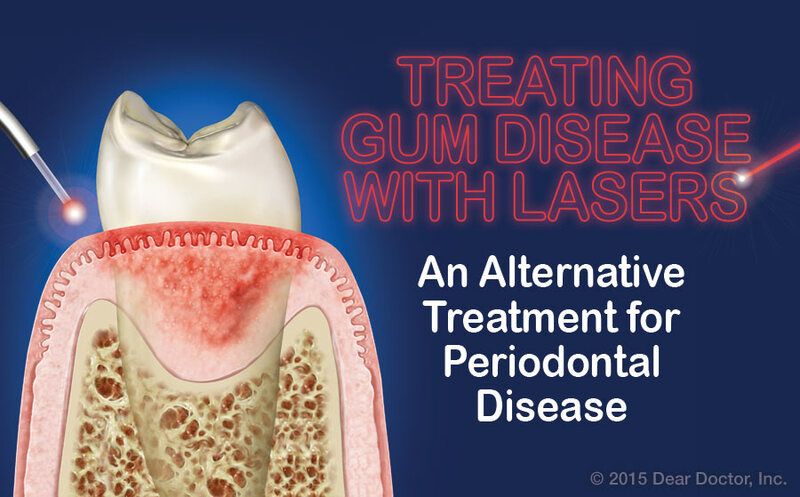 Today’s dental lasers are more focused and targeted for specific issues, including treatment of periodontal (gum) disease. This has allowed research to directly compare such innovative laser treatment techniques with traditional treatment regimens — important when you want to know if they really work! Periodontists in particular have found that removing diseased tissue with lasers rather than a scalpel can be more comfortable for dental patients. Periodontists (dentists who have three years of specialty training in the diagnosis and treatment of diseases and disorders of the supporting structures of the teeth) in particular have found that removing diseased tissue with lasers rather than a scalpel can be more comfortable for dental patients. That’s partly because a laser actually seals the tissue it cuts, rather than leaving a wound that requires stitches; there are no incisions separating the gum tissue from the underlying bone so that it is considered minimally invasive. There are other interesting differences between laser surgery and traditional therapy — both of which are effective in treating gum disease. But let’s start by exploring why a person may need periodontal (gum) treatment in the first place. There are various forms of periodontitis (“peri” – around; “odont” – tooth; “itis” – inflammation), but all result from an interaction between bacteria and the body’s immune (defense) system. The bacteria reside in a “biofilm” that collects around the teeth at the gum line in the absence of effective daily oral hygiene. If this biofilm is not removed daily, it can harden (calcify) on the root surfaces of the teeth, forming what’s known as calculus or tartar. The inside lining of the gum tissues becomes chronically inflamed and ulcerated in response to the perpetual presence of bacteria. As the disease progresses, the inflamed and infected periodontal tissues start to lose their normally tight attachment to the tooth. When this happens, spaces that are known as periodontal “pockets” open between the gums and teeth. As pocket formation progresses, supporting bone is lost around the teeth. If enough tooth-supporting bone is lost, the teeth themselves loosen and eventually will be lost. Treating gum disease is primarily aimed at controlling the cause. Susceptible individuals must learn to brush and floss properly to remove bacterial biofilm. They also need a thorough cleaning and disinfecting of the tooth-root surfaces beneath the gum line. Traditionally, this is carried out using handheld instruments and ultrasonic cleaning tools. Left: The diseased soft tissue filling the pocket area has been removed, revealing tartar and plaque on the roots that will be cleaned. 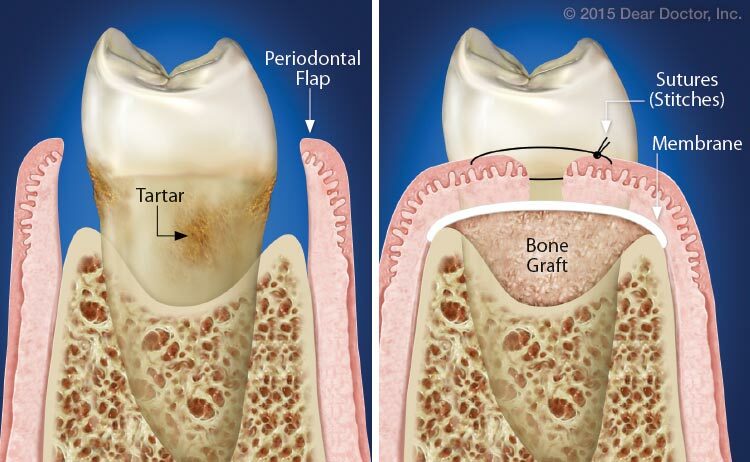 Right:The gum flaps are stitched together as closely as possible to protect the graft that will replace lost bone. In more advanced cases, surgical treatment may be needed to help periodontal tissues — the gums, the periodontal ligaments that connect the tooth roots to the bone, and even the bone — reattach to the teeth. Surgical treatment involves opening the gum tissues by creating flaps — like flaps on an envelope — to see within the pocket. This allows the surgeon to remove diseased tissue, fully clean the root surfaces, apply grafting material and other biologically active aids like membranes to enhance new tissue growth, and suture or stitch back the gum tissues, securing them in position while they heal.